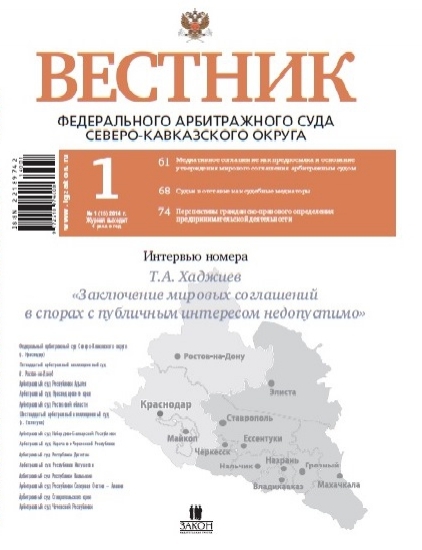 ﻿ Magazine content за Январь 2014 г. The article presents a comparative legal analysis of the procedural rules governing the institution of settlement agreement, designates the issues that have not received legislative solution, formulates proposals aimed at harmonizing the civil procedural laws. The article examines the enforcement of settlement agreement in the arbitration proceedings for which there is no uniformity in judicial practice. The article gives a practical analysis of issues relating to the conclusion of the settlement agreement in arbitration proceedings at appeal stage, as well as of the issues related to cassation of the trial court orders on decline of settlement agreement approval. Typical examples are given relating the practice of the Sixteenth Arbitration Appeal Court for the cases of this category. The article is devoted to the comparative analysis of the settlement and mediation agreements. Their similar and distinctive features, as well as the specifics of conclusion are examined in the article. The author analyzes the issue of the relation between mediation and settlement agreements and their legal correlation. The article also contains criticisms regarding the lack of mandatory content requirements in the mediation laws which should be applied in mediation agreements approved by the arbitration court as the settlement agreements. The article discusses the prospects of developing conciliation procedures in Russia. The author considers the use of conciliation procedures under trial as a priority to improving mechanisms for settling economic disputes. Particular attention is paid to the possibility of bringing retired judges and assistant judges to court mediation. The publication is focused on one of the major categories of the civil law, the concept of entrepreneurship. The issues of private law dualism are discussed. The authors analyze the development of a legal definition of entrepreneurship in Russia. Analysis of the scientific literature and foreign legislation allows the authors to formulate a new vision of the civil construction of entrepreneurship. The article deals with the issue of correct choice of the civil proceedings form and proper remedy, exemplified with recognition of right as a means of civil rights protection. The author analyzes correlation of use of the claim for recognition of rights, the action for declaration of right, the statement of establishing the legal facts of possession and use of the property, and declaration of proprietary rights in the manner established by Chapters 33 of Civil Procedure Code of RF. Contract for rendering mail services is defined by the author as a separate enterprise agreement, which must not be confused with the shipping contracts. The article criticizes the view, according to which the contract for rendering mail services is considered as a mailing contract. The article investigates the rights gained by the author due to creation of intellectual property. The author’s rights are divided into the property rights and personal non-property rights, the criteria are suggested for dividing the rights into subgroups. The article discusses the institute summary proceedings in the arbitration process, its emergence, development, problems and prospects. The article presents analysis of some aspects of defining the jurisdiction of the supreme courts in the USA and Canada at compiling their constitutions, taking into account the political and economic conditions in the countries, as well as the impact of jurisprudence on its further formation.